"Being" is not superior to "doing", or vice versa. Doing the works of the Kingdom (being missional) should be part of the natural fruit of being in the Kingdom. Living with a missional purpose is meant to impact all areas of our lives, not just when we're "doing" stuff outside the four walls of our church or home group. Basically, there should be no "missional on/off switch" in our thinking. Being on mission with Jesus should -- as we grow and mature as Christians -- feel more and more like second new nature. I really appreciate the simplicity of Mike's phrase "being aware of others"; this is something we can only do if we're engaging in relationships with the people around us, both inside the church and out. We have to be connected in order to become aware. Aware of needs -- prayer needs and practical needs. Aware of opportunities to serve. Aware of the relationally good, bad, and ugly. We cannot rejoice or weep with others if we're not aware (Romans 12:15). Being aware naturally leads to serving others. Indeed, it would rather hypocritical to do nothing once we've become aware of needs. 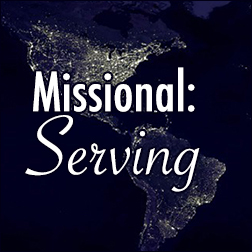 As we continue to pursue being missional as a lifestyle, having a sense of purpose (being "on mission" with Jesus), and engage in relationships, we will discover many real and practical ways of serving our communities -- in the church, the neighbourhood, and our towns/cities.